September update - 1000 lb milestone reached! We are happy to announce that this month we hit a milestone with regard to the quantity of food delivered to members of our community. In this month's distribution we delivered more than 1,000 lbs of food to families in need. 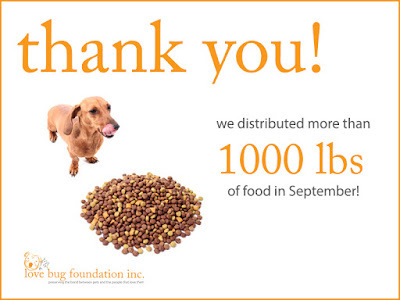 As a point of comparison, our very first distribution in April was 75 lbs. The ability to help all of these families is made possible by our supporters that check in month after month to make sure we can meet the demand of our recipients. Speaking of our supporters, we want to make sure that we again say a tremendous THANK YOU to both the Fayette County Clerk of Courts office and the Clayton County District Attorney's office. Both of these offices have been instrumental in bringing in much needed pet food donations and helping us build awareness about our pet food assistance program. In closing, we have noted a few additional items below. Please consider reaching out to us with questions or if you would like to get involved. 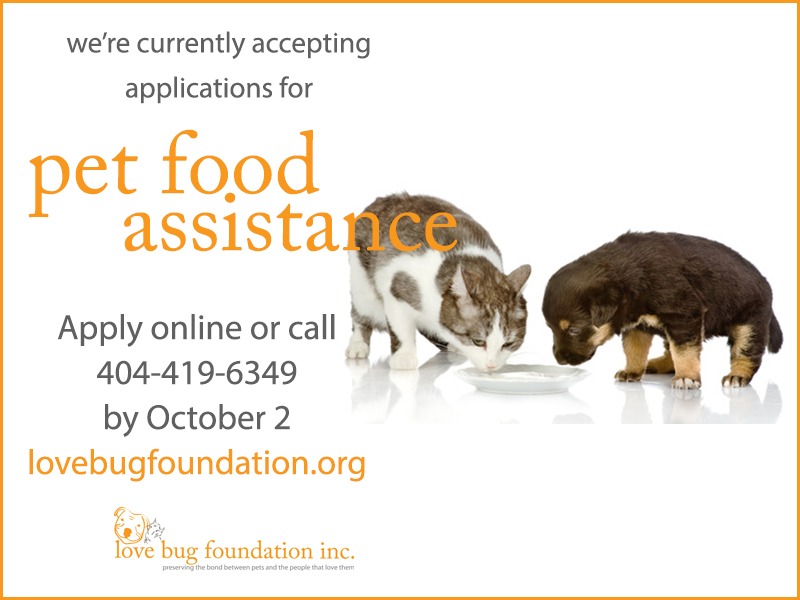 October distribution - Deadline to apply for pet food assistance in October is Friday, October 2. 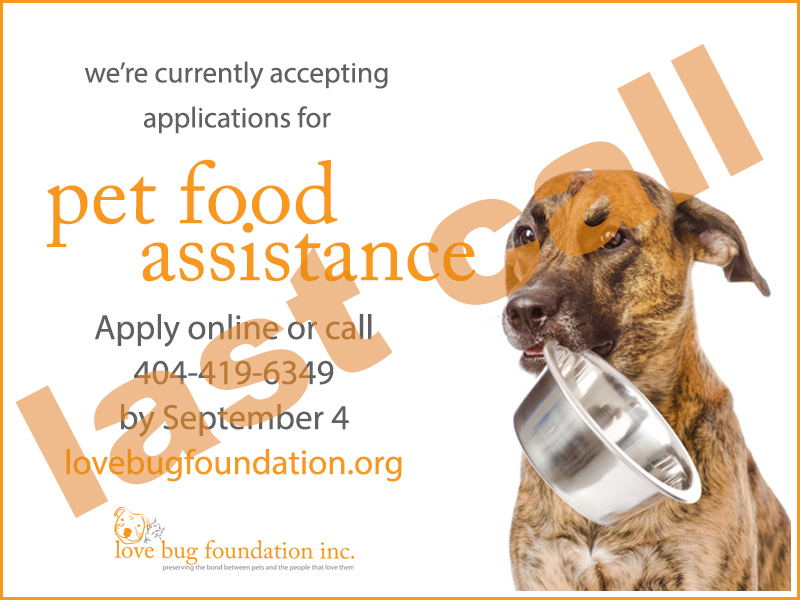 Please remember to call or email us prior to the deadline. 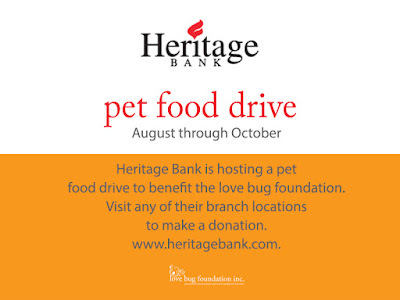 Heritage Bank pet food drive - Pet food can be dropped off at any of their branch locations during normal business hours. The drive will run through the end of October. Don't forget . 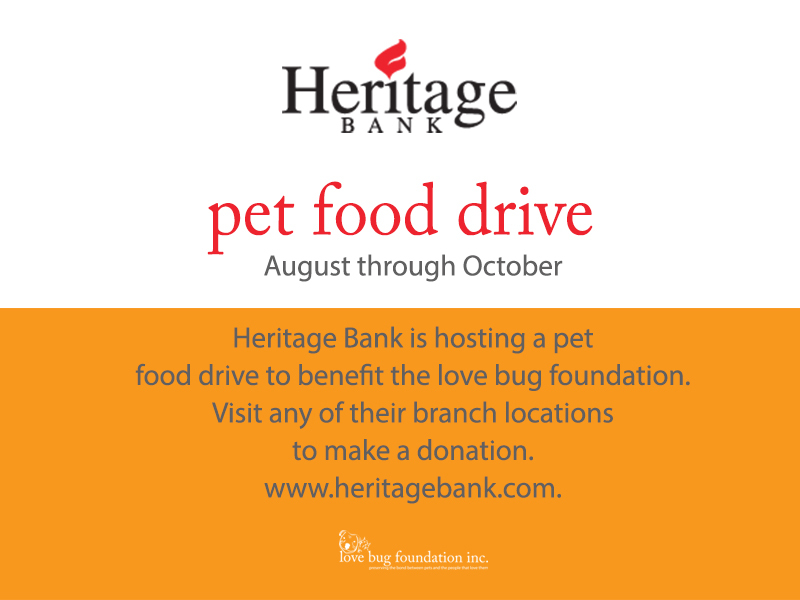 . . Heritage Bank is hosting a pet food drive to benefit the love bug foundation from August through October 2015. Donors can stop by any of the six Heritage Bank branch offices to drop off dog or cat food. We are very grateful to Heritage Bank for supporting us in our mission. Please visit their site to locate the branch most convenient for you: Heritage Bank - Locations and share a copy of this image on Facebook and Twitter. Thank you all in advance for your support, especially Heritage!! !